From the time I was a teen-ager, life was difficult. My mother lacked the means to support us and was evicted from the apartment we were living in. Not knowing where to turn, I took to the streets, staying with friends and relatives for brief periods of time. While living this precarious lifestyle, I gave birth to two children who were eventually placed in foster care. Getting my children back provided the motivation I needed to change my lifestyle. My older sister learned about Good Shepherd Center through an online search and encouraged me to call. I called Languille Shelter the next morning and was relieved to learn that they had a bed available. I felt hopeful and supported knowing that Good Shepherd Center encourages reunification of families. 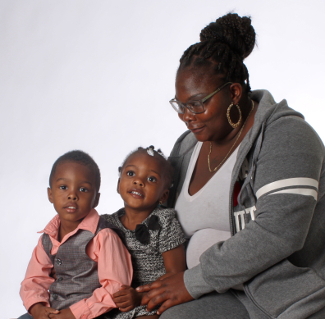 During my stay at Good Shepherd Center I continued to go to court to try to get custody of my children, but in order to gain custody, I needed to provide them with stable housing. In December I moved into Farley House, Good Shepherd Center’s home for women and children. After this move, I was granted permission for my children to visit. I was granted custody a month later and the children moved into Farley House to live with me. Although custody was foremost on my mind from the very beginning, I also made great progress in achieving my goal of supporting myself and my children financially. With the help of Vocational Rehabilitation, I completed training to become a security guard. Living at Languille was an eye opener for me and a motivator. My case manager stressed the importance of looking for a job, saving money, securing an apartment, and staying on track to complete these goals. I was able to accomplish all of this. In addition, I attended Life Skills classes and found that the nutrition and parenting classes were especially helpful. My children and I moved into our very own apartment in March. I am grateful to Good Shepherd Center for the support I received to reunify with my children and to transition to a more stable, independent life. I will continue to receive support through Good Shepherd Center’s aftercare program.